It’s been seven years since Apple began its mission of mobile dominance via the App Store and, today, while it shares market share with others – most notably, Google (News - Alert) Play – what it undeniably accomplished is launching us on a path to app-centricity. Today, if there isn’t an app for something you seek to accomplish, there likely soon will be, as businesses in every vertical have realized the way to a customer’s wallet is through his smartphone. What’s changed of late, however, is the shift of mobile apps from an optional component of the customer engagement cycle to a necessity. Naturally, that doesn’t reduce the importance of traditional customer contact channels; rather, it is another opportunity for positive interactions with customers. Likewise, it’s an opportunity to alienate customers and prospects with poor app experiences and, speaking frankly, there are a lot of mobile apps out there that are effectively worthless due to slow load times, lack of functionality, or a steep learning curve. A recent CA Technologies (News - Alert) survey, conducted by Zogby Analytics, polled both consumers (6,770 respondents) and corporate decision makers (809 respondents) in 18 countries about their sentiments toward mobile apps. The results confirm the rise of apps to a critical component of the engagement cycle, starting with load time – there is only one chance to make a first impression, and this is it. Of consumers who have had negative experiences with application load times, 68 percent expect applications to load in less than six seconds. More than half of those, however, consider three seconds or less to be an acceptable load time. The message is simple: Make sure your app loads quickly, or you’ll risk alienating users quickly. I can’t count the number of apps I’ve personally removed from my mobile devices because they don’t load quickly. The other interesting result from the survey relates to loyalty as it pertains to application performance. 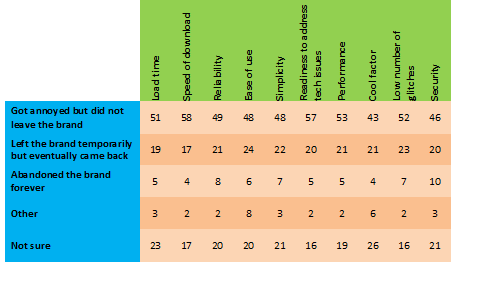 Consumers were also asked how well they feel businesses are addressing the app experience. The following table shows how those who responded Fair to Poor have responded to a poor app experience. The study only strengthens the message that brands must ensure the quality, reliability, stability, and functionality of their apps before rolling them out to customers. The apps are no less a representation of their brands than are their products and, in many cases, are the path to the product. Therefore, a poor app experience stands a strong chance of creating lost revenue, simply by making research or purchase difficult. App security alone presents an opportunity for 10 percent attrition – and every customer that leaves has to go somewhere. When you look at those who left but eventually came back, even temporary attrition represents revenue loss – as well as loyalty degradation. The next time, those same customers may move to the “abandoned” line. And how many times must a man be annoyed, before you can call him a former customer? The answer is not blowin’ in the wind – it’s in the app. When developing a mobile app for your business, take the time to not only ensure technological stability, but also consider the human factors – usability, cool factor, features – and solicit feedback from real customers on what the app should look like, which features are critical, nice to have, and unnecessary, and perform proper testing both in the lab and (again) with real customers, to see how it will perform. Make sure your development process isn’t half fast – because your customers will be faster to defect if it is.